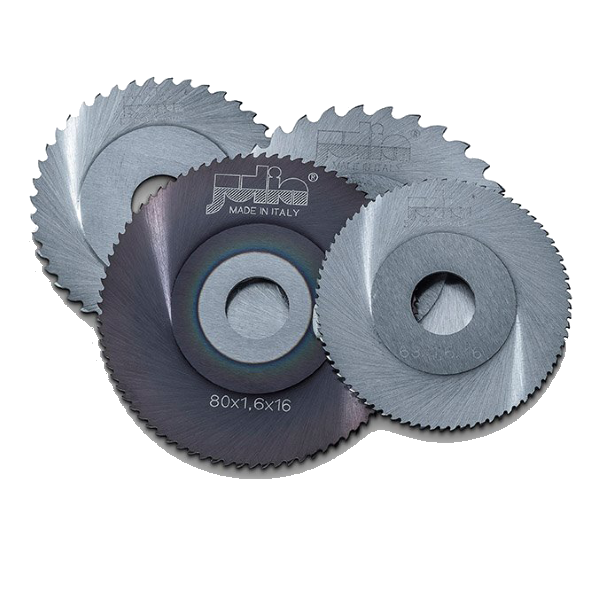 Julia is the largest worldwide producer of DIN circular saw blades for a wide range of applications: micro-mechanics, jewellery, portable orbital cutting tube, screws and bearings etc. Our products are used on CNC machines, transfers or specific machines for cutting steel, precious metals like gold, silver, alloys and plastics. We have on stock all the standard DIN saws, toothed with A, B and C form. Julia can also manufacture special products to meet specific customer needs. All the HSS DIN range is available from stock, so we can optimise delivery times and exceed customer expectations. Our DIN saws are manufactured with the hub in order to improve the stability of the tool during the cut. 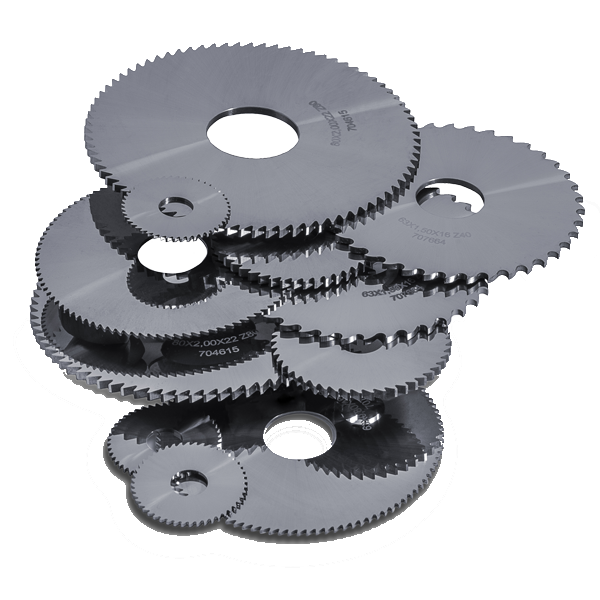 These saw blades are made in DMo5 and Co5 with a reduced run out and low parallelism. Din saws are sharpened to Din 1837 A (tooth form A for industrial standard), Din 1838 B (tooth form B) and Din 1838 C (tooth form C). Saws manufactured in HSS-Dmo5 and HSS-Co5 suitable for portable orbital cutting machines. These are built with BW tooth form in order to guarantee the chip evacuation, and are used on tubes with wall thickness between 3 – 5 mm. For cutting stainless steel it is very important to use HSS-Co5 saws, which can offer longer tool life and a better surface. We can also produce these saw blades with P.V.D coating. We produce specially designed saws suitable for jewellery cutting (gold, silver etc.). 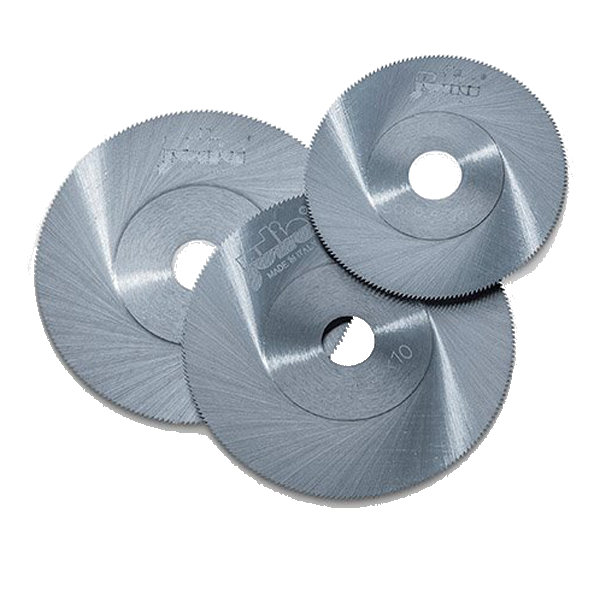 These blades are very thin to ensure the valuable scrap is reduced to a minimum. The hub is strengthened to give the disc the correct stiffness. All the saw blades have a very small pitch T < 1 mm in order to cut the irregular sections gently. In order to cut screws or bearings, it is very important to use a very stable saw blade with a very precise thickness. To do this we offer this product flat ground without hub in order to guarantee a steady and precise cut after sharpening. 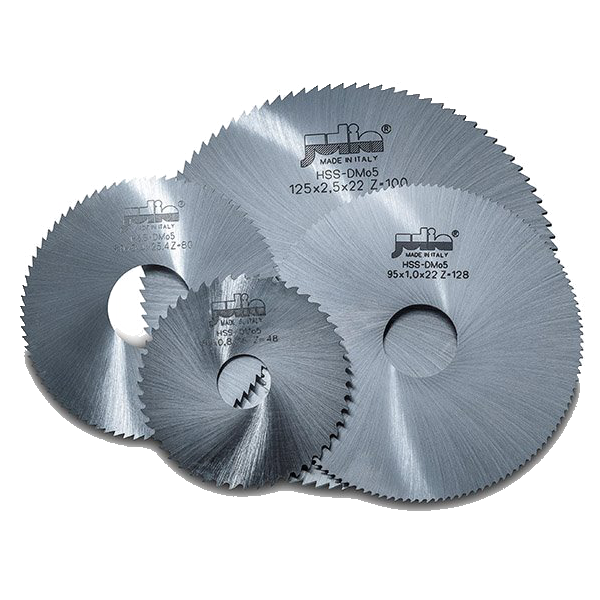 On demand, we can manufacture this particular saw blade with a keyway. 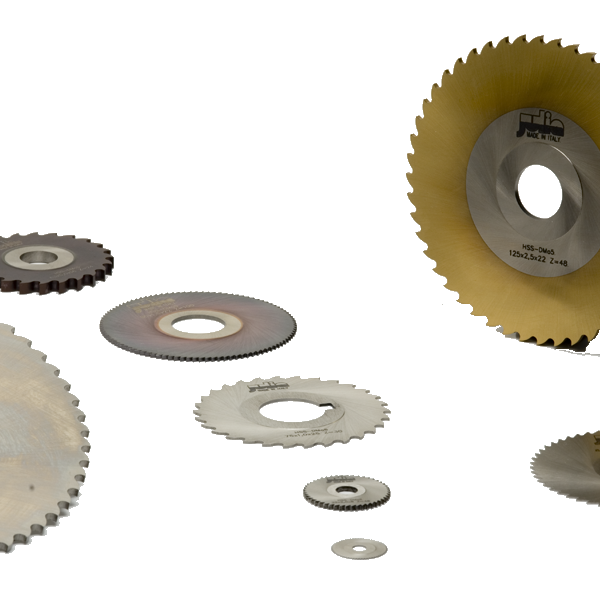 All ours HM DIN saw blades are manufactured without hub, with a very low parallelism, and feature teeth according to norm Din 1837 A (tooth form A industrial standard) and Din 1838 B (tooth B form). We grind all the surfaces with mirror finishing in order to obtain the best cutting results. The only carbide we use for our saws is extra fine grain, manufactured by a Swiss producer.